Just what exactly is the Fiscal Cliff? Lately there has been a lot of talk about the impending Fiscal Cliff and its potential to derail the current fragile US economy. However, there hasn’t been a lot of talk explaining exactly what it is or how it even came to be. In this post we’ll take a deeper look at the situation to determine if things are really all “doom and gloom” or if things are just being blown out of proportion. New taxes imposed by the Patient Protection and Affordable Care Act and the Health Care and Education Reconciliation Act of 2010. 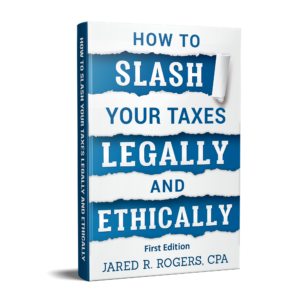 The major concern behind all the “doom and gloom” talk is that if the current laws slated for 2013 go into effect, the impact on the economy could be dramatic. While the combination of higher taxes and spending cuts would reduce the deficit by an estimated $487 billion, the Congressional Budget Office (CBO) estimates that gross domestic product (GDP) would be cut by four percentage points in 2013, sending the economy into a recession (i.e., negative growth). At the same time, it predicts unemployment would rise by almost a full percentage point, with a loss of about two million jobs. The nice little info graphic below illustrates all the components in play and what happens if lawmakers let all the policies go into effect (left side) vs. if some type of tax and spending concessions are made (right side). Given how late Congress acted in 2011 regarding the debt ceiling (i.e. item number two under “The Fiscal Cliff Explained” above), the cost of indecision is likely to have an effect on the economy before 2013 even begins. The CBO anticipates that a lack of resolution will cause households and businesses to begin changing their spending in anticipation of the changes, possible reducing GDP before 2012 is even over. Having said this, it’s important to keep in mind that while the term “cliff” indicates an immediate disaster, the impact of the changes will be gradual at first. What’s more, Congress can act to change laws retroactively after the deadline. As a result, the fiscal cliff won’t necessarily be an impediment to growth even if Congress doesn’t address the issue until after 2013 has already begun. However, one thing to note is that the US debt picture is not in a good place currently. Pictured below are some nice graphs on projected budget deficits and historic US federal debt levels to help put things in perspective. We can only hope that our politicians and lawmakers will sit down NOW and make those difficult decisions to help right a situation that could potentially get much worse in the years to come. Budget deficits, projected through 2022. 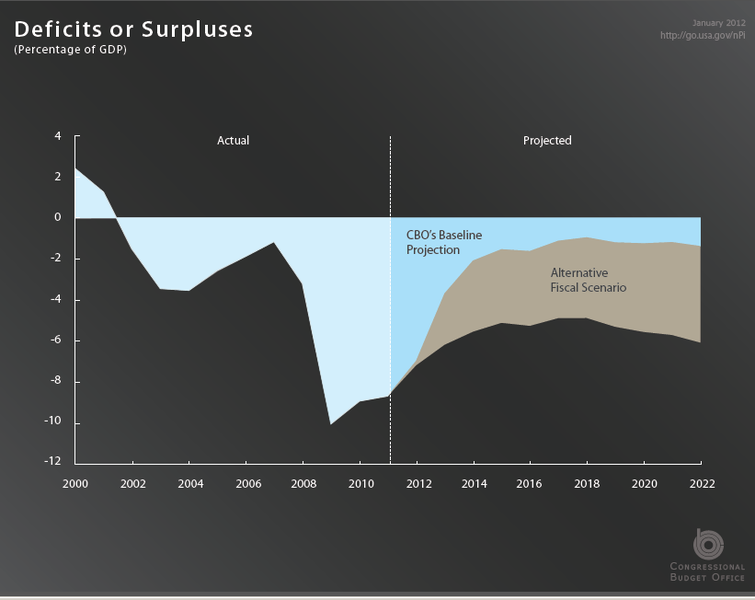 The “CBO Baseline” shows the effects of the fiscal cliff under current law. The “Alternative Scenario” represents what would happen if Congress extends the Bush tax cuts and repeals the Budget Control Act-mandated spending reductions beyond the end of 2012. US federal debt from 1940 to 2022. 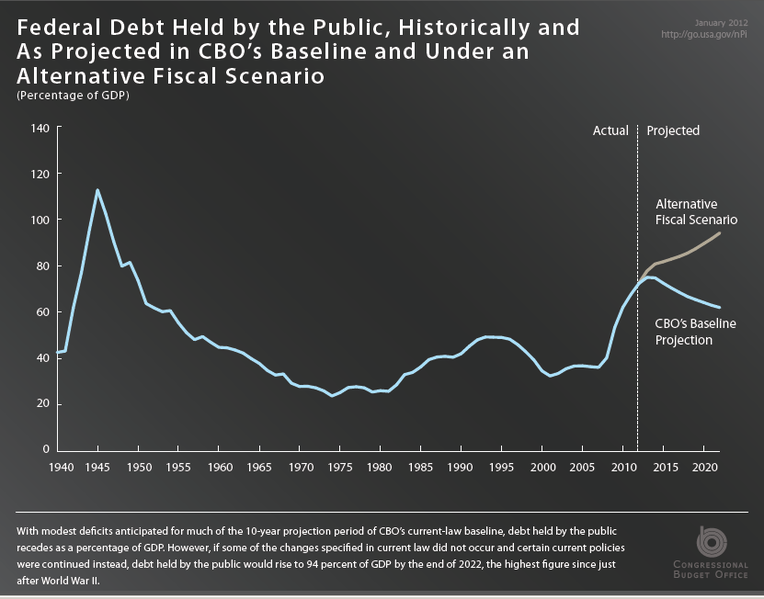 The right side of the diagram projects what would happen to the debt if Congress (a) allows current laws to take effect and reduce the deficit (the baseline) or (b) extends the current policies, such as keeping tax cuts in place (the alternative). This entry was posted in Accounting Talk and tagged budget deficit, CBO, debt, Fiscal Cliff, Sequestration on November 15, 2012 by Administrator.